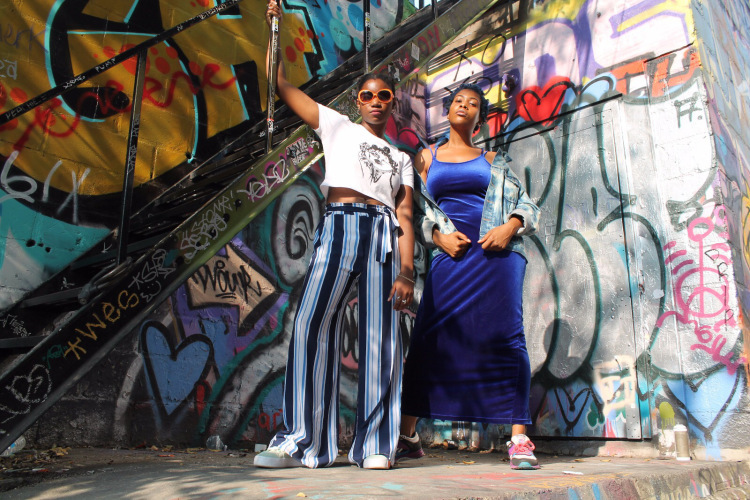 Learn more about Anelia Victor and Renee Mcphee the creators of The Original Smiths. Creative. Unique. Persons artistically skilled. Cannot be imitated. We are the Original Smiths. Introducing Anélia and Renée of The Original Smiths. Hello. Hallo. Bonjour. Waddup? The Original Smiths is a retro, vintage and upcycled online clothing store that showcases artists creativity through style. We spotlight exclusive pieces that shout “I am different; I am present; I am here!” and those pieces reflect each and every artists we bring onto the journey. We created The Original Smiths after years of late night conversation of wanting to create a brand that defined the both of us; fashion & art. Renée’s love of language is seen throughout her poetry, life and style; she lives and breathes through her words. Anélia thrives by creating nothing into an interesting body of work through the means of designing clothing. When we combined both of our talents, we created this magical brand. We are excited to offer affordable hand-picked pieces that not only make you look amazing but also make you feel sensational. We love fashion, art and all things magic. Our site allows us to share our passions with you. The truth about us is that we strive to be like no other. Normal is boring. We are artists, individuals in our own right, sharing our distinct fashion styles with you through one of a kind items. Clothes have a story. Tell us how our pieces make you feel. Inspire us.